Seeing all the beautiful cherry blossoms this time of year inspired me to make my first Easter tree, using a few branches of cherry blossom. 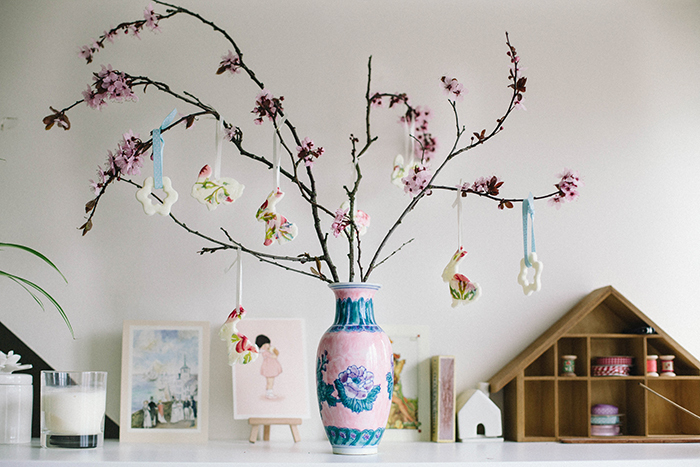 Easter trees have never been a tradition in my family but it’s something I want to do every year now, simply for the purpose of bringing a feeling of Spring into my home! 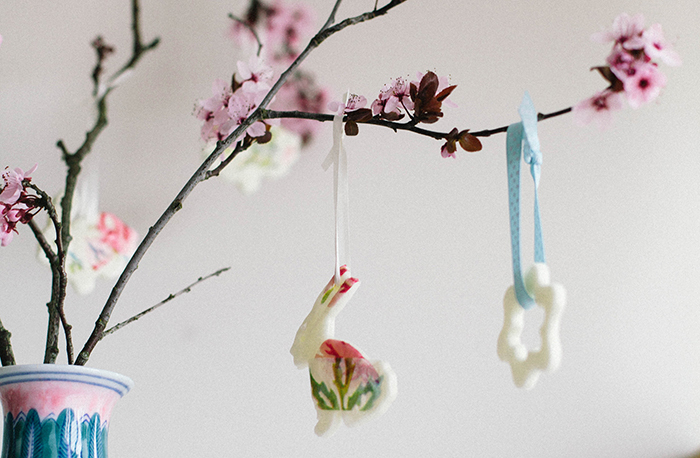 To decorate the tree, I used a simple homemade clay using PVA glue and cornflour to make some Easter bunny ornaments. You could also just use salt dough but I just happened to have these ingredients to hand. I then used decoupage to decorate the ornaments and hung them on the tree with some ribbon. It probably goes without saying that this would be a real kid-friendly activity but it also makes a stylish addition to your home. It looks great on a shelf, the mantle place or on a window sill. Do you follow this Easter tradition? Mix the PVA glue and cornflour together until you get a smooth dough. Add more glue if it’s too dry and more cornflour if it’s too sticky. 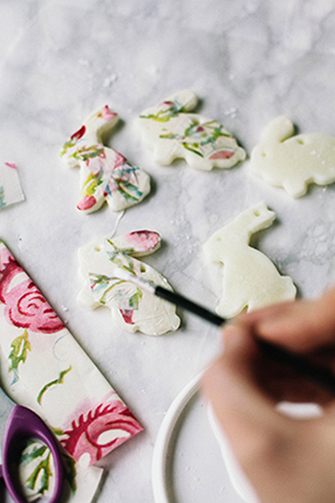 Roll out to a 1cm thick dough and use cookie cutters to create shapes. Use a straw to punch a hole in the top of the ornaments so you can thread string through them later on. Leave the ornaments to dry out overnight at room temperature. In the morning they should be rock solid. To decorate, brush some PVA glue over the ornaments and assemble small pieces of tissue paper on top, brushing more glue on top to seal it. Leave to dry for at least 1 hour. Arrange in a pretty vase or jug filled with a little clean water. Thread your ornaments with some string or ribbon and hang them on the branches. 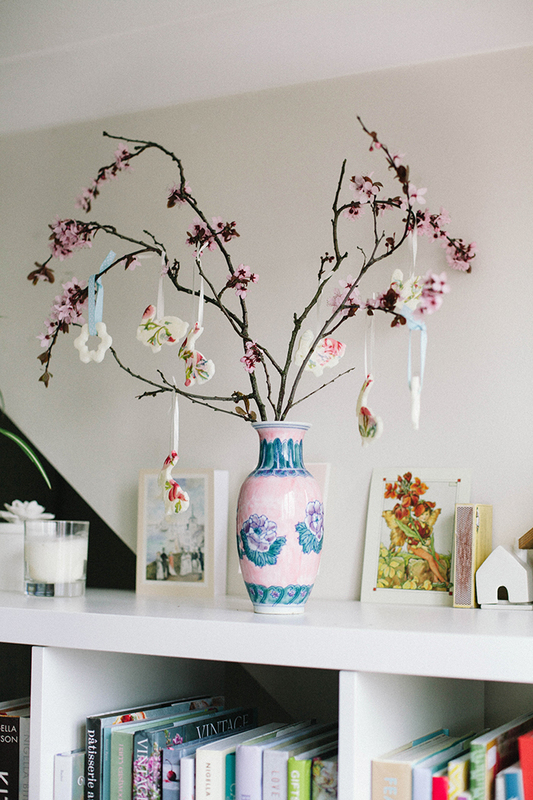 The blossomed branches should keep fresh for a week or two indoors, just change the water a couple of times. Absolutely gorgeous! I just love it. Can't wait to try some of your beautiful recipes. Thank you very very much! It's an honor to have you featured. 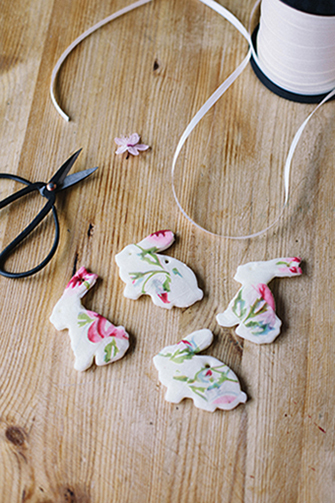 Aaand, here's the result: http://aliciasivert.blogspot.se/2015/03/paskpeppen-2015.html Happy Easter! What a lovely Easter Tree and the decorations are beautiful! I love the bunnies. This is so pretty, Aimee! I love how crafty you are, these would be such a fun project I can do with the kids too! Gorgeous! Thanks Kelly :-) Yep, it's definitely a great project for kids - I really felt child-like when I was making them. Anything with PVA glue brings me back to memories of childhood crafts!